Let's enter the world of my favorite consulting detective the best way I know how, nail art! 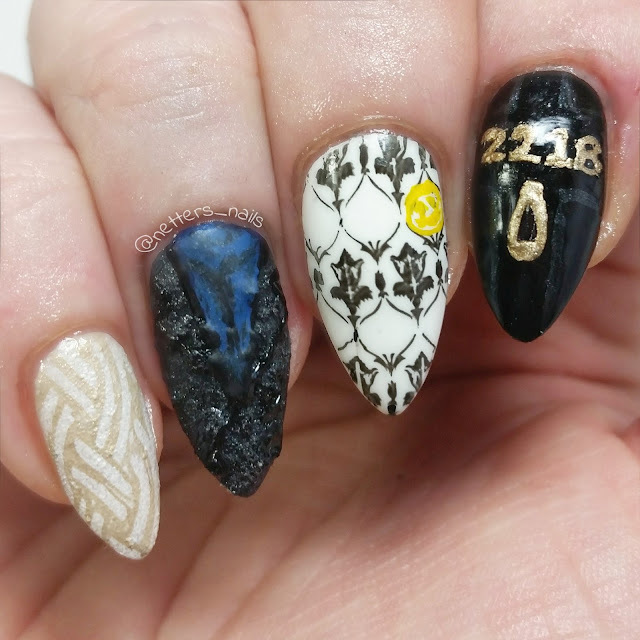 Though I have a love of Sherlock in all of its incarnations this mani is inspired by the modern day BBC series with Bandersnatch Cummerbund and Bilbo Baggins. Sorry, nope scratch that I mean Benedict Cumberbatch and Martin Freeman. Now as much as I don't like "the claw" I also wanted to show off my thumb too! Here we have John's wooly jumper, Sherlock's coat and blue scarf, the wall, everyone's favorite door, and the opening title scene of London. For the pinky I sponged Sally Hansen Groove-y!, China Glaze Five Rules and Sinful Shine Wisp until I got it the color and texture I wanted then stamped China Glaze Five Rules mixed with China Glaze Passion and Intelligence, Integrity & Courage using Moyou Pro xl Plate 2. The ring finger was a mixture of China Glaze Black Diamond, China Glaze Intelligence, Integrity & Courage, and Wet'n'Wild Black Creme until I got the desired texture and color pattern. Then using a detail brush I drew on coat details (which are unfortunately harder to see in the photos than in person) and his scarf using Revlon Indigo Night and a matte top coat. Using Moyou Geek xl Plate 5 I stamped the wallpaper paterm onto Sinful Shine Wisp with Wet'n'Wild Black Creme and outlined the smiley face with Sinful Shine Bananappeal. 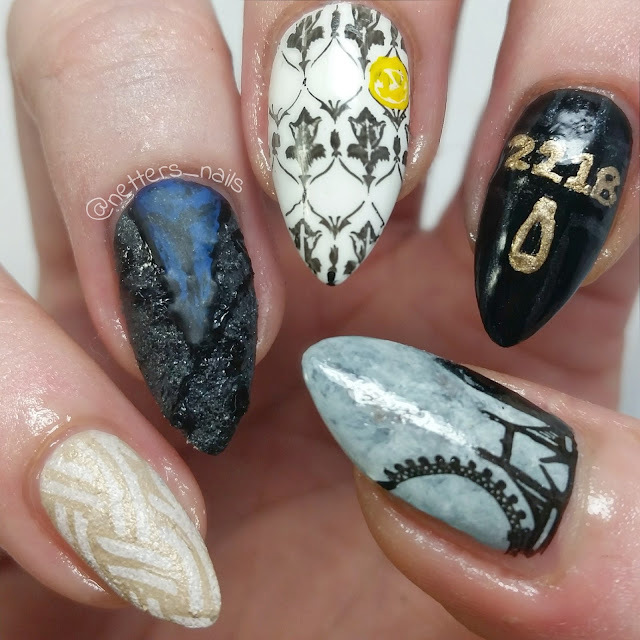 The 221B door was done with a base of Wet'n'Wild Black Creme, freehandEd numbers and knocker in China Glaze Passion, and line details in China Glaze Black Diamond. And finally I did the saran wrap technique on my thumb using China Glaze Intelligence, Integrity & Courage and Sinful Shine Wisp with a few drops of China Glaze Black Diamond to get the cloudy sky effect and then stamped from Moyou Tourist plate 1 with Wet'n'Wild Black Creme. Whew there was a lot there but I'm super proud of how these turned out! 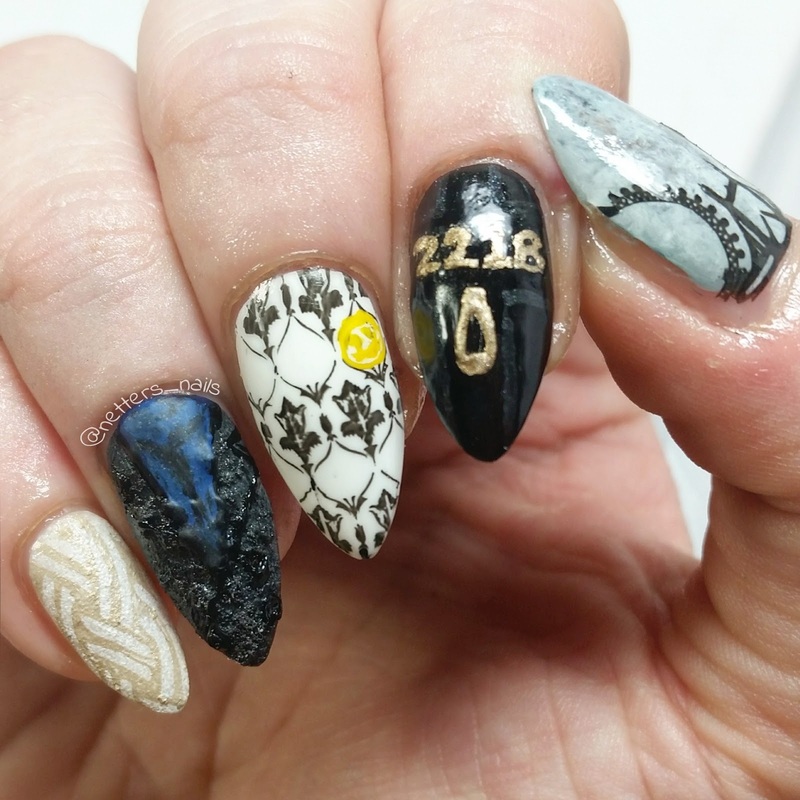 And even if we lose the contest I did these for I'm still in love with them.